Black Friday is November 23rd FYI. Details on other releases can be found on the Record Store Day website. 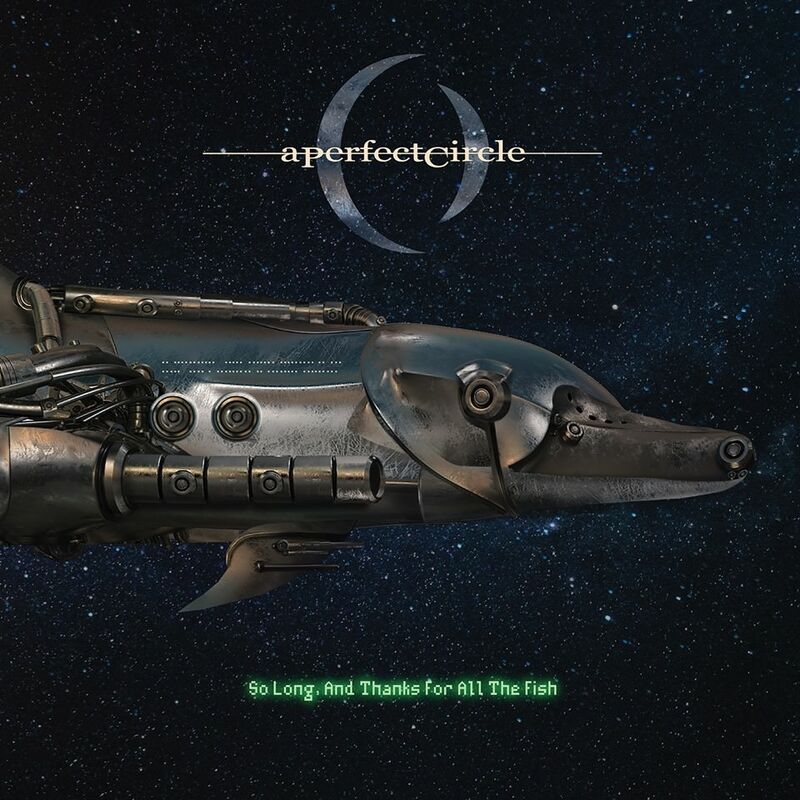 The last A Perfect Circle album came out in 2004. Are you guys against putting out another one? No, I’d love to—when the time is right. It would be awesome. I’m trying to write songs with that in mind, but … right now, I’m focusing most of my energy on a new Ashes Divide record, which is under way with 11 songs. Still working on finishing vocals and writing lyrics, and hopefully get that thing mixed in January or February. UncleJackson emailed me today with this quite interesting interview with Maynard on Loudwire, where he mainly discuss Puscifer, but also comments on his recent work with A Perfect Circle, and the progress on the new Tool album. Tool are reportedly working on a new album, as well. In the past, you’ve expressed frustration with sitting around in the studio with guitarist Adam Jones and drummer Danny Carey’s aesthetic of going over endless combinations of song structures before committing to anything. I’m allowing them their space to do what they do, so we’re still in that mode. Even if they told me how close they are to being done, I couldn’t tell you because if I say 60 percent people will start counting down. When it’s done everyone will know. But I haven’t done anything yet. They write forever and then we go in and knock it all out. We’re writing. We’re writing vocals. But nothing’s solid. With Puscifer, there’s ideas and then we’ll record stuff. Then we’ll go back and change stuff and fix stuff and record new stuff before we finally put it all together. But with Tool, we practice jams, but there’s no actual recording going on until it’s time to record. It has nothing to do with putting my foot down. Physically, I can’t do it, so that’s not gonna happen. We will tour, but it won’t be the old school dog and pony show of eight months of beating yourself to death. For most bands now, staying out on the road for a year-plus and selling lots of tickets and merch is the only way to make money because their albums are being downloaded for free by file-sharers. How much do you need, really? If we can make a living going out for a few weeks a year and keep people satisfied by making sure we play the locations we need to hit, I’m not Kirk Hammett. I don’t need to buy $10,000 guitars every day. That’s not my lifestyle. I love Kirk, but that’s not me. I have a very sustainable vineyard industry in the Valley which will eventually start to pay its own bills. I love to go on the road and play music for people and express myself, but for it to be something where I’m out there to make money, that’s depressing to me. You end up beating yourself up. Who gives a s–t how much money you have if your back hurts so much you can’t stand up. Money’s not the goal. Having fun making the art, that’s the goal. Finding a nice, happy medium. Being healthy and still expressing what you need to express in an effective way, that’s the ideal. The end of lengthy world tours comes as no real surprise to me. I’ve said before (at least in the forums) that I expect Tool’s touring habits will become a little less album orientated, where they hit the road for a month or two once every year or so. Though I imagine with the new album there will still be a world tour, it just may not be so tightly scheduled as it has been in the past. Got an email from Graham yesterday tipping me off to a TV advertisement for the coming ID game Rage which features the track Counting Bodies Like Sheep to the Rhythm of the War Drums by A Perfect Circle. We couldn’t find the link, but this morning I read on the Bethesda Blog that it’s now available on Youtube. I can’t verify the video at the moment, as I’m in the office, so let me know if if it works, and presuming it does, what you think. A Perfect Circle toured all across the US (and occasionally Canada) this summer and from all reports it was a good, though somewhat controversial tour. Much of the controversy revolved around the choice of setlist for the tour. 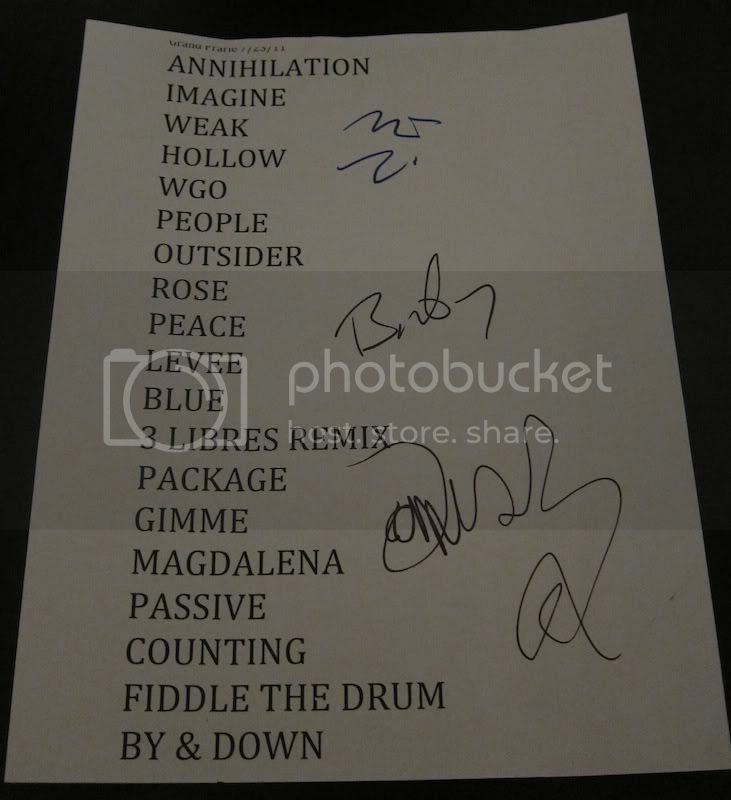 The setlist changed from night to night, however played mainly songs from their last album eMotive. Many fans, not being such huge fans of this album, were disappointed that they didn’t get to hear more tracks from their favorite albums Mer De Noms and Thirteenth Step. (What’s So Funny ’bout) Peace, Love and Understanding? Personally, I was disappointed to read that the set was largely covers. Far be it for me to dictate to a band what they should and shouldn’t play, but I find it a little distasteful that a band I’d pay money to see play a set with so many cover songs in it. If I wanted to see a covers band I could go down to the local pub and see one for nothing. That said, I do wish I could have seen the tour for myself. It’s all too easy to judge a band on their setlist, not taking into account the atmosphere and dynamics of the show. Speaking of which, from all reports the stage setup and lighting was excellent, with the band playing in front of a large metallic curtain with the APC logo on it. As usual, Junior seems to have done a fine job with the lighting. One thing many found quite interesting about the shows was that a new song, By And Down was played. Normally the final song in the set, this moody song sounds more like a Thirteenth Step track than a Mer De Noms one, and there are plenty of bootlegs available on Youtube for those interested. A reasonable number of you attended the shows as VIPs, and the reports from that experience were generally pretty positive. VIPs received an APC bag, a poster and possibly some other stuff, and also got the change to experience the sound check, as well as get some premium seats at the shows. There were a few hiccups here and there, but it seems as the though the VIP tickets offered good value for those that picked them up. One of which of course is Puscifer. We’ve already been warned to expect a tour in October/November. On the Ashes Divide front, they are close to completing a new album, so I’d be expecting to hear that and a tour as well, probably early 2012. By & Down is the only new APC track for now, and they’re looking at a release in Fall/Winter. Digital download was suggested as the format of the release. The recordings for the 2010 show came out well. Billy was quiet as far as a DVD goes, but suggested that some of the live tracks would be available with By & Down. Setlist criticisms aside, everyone who’s caught a show on this tour so far seems to have enjoyed it. If you get the change to catch one of the last few shows this tour, then I suggest you do! The show last night seemed like an interesting affair, and I won’t elaborate any further in order to not spoil it for those wanting to be surprised. On that note I’d like to remind people to keep setlist spoilers only in the appropriate show thread inside the forum. A bunch of small non-Tool updates for you all this morning. Interested in Maynard’s latest project, Puscifer? Big news coming soon; join theFacebook page to be one of thefirst to know. Nothing has appeared on the Puscifer Facebook page as yet, which can be found here. Lastly, todays Children of Saturn show features The Jesus Lizard/Qui singer and Schism commentator David Yow. You can find more details on how to tune in here.